Thanks for attending #TMMC, Plus "What's Your Platform?" First off, we'd like to thank everyone who attended The Mobile Marketing Conference last week and helped to make it such a great experience. As we start to sift through out video footage and notes, expect lots more coverage of the subject right here. Our partners at 3Seventy have put together a great wrap-up post already, sharing their main takeaways. Check it out here. One question that came up frequently over the course of our 3 days in Miami was "What platform?" - with attendees occasionally being asked what platform they personally were using. The best thing to do when faced with this question is to look at the data - what does your analytics platform have to say about your visitors and what browser they are using? 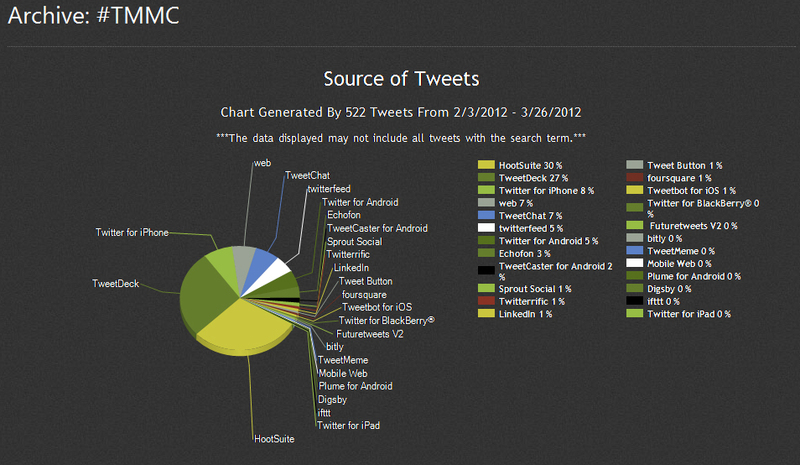 For fun, I grabbed the screenshot below showing what platform users of the #TMMC hashtag on twitter were coming from. Behind HootSuite and Tweetdeck, Twitter for iPhone was our mobile winner coming in at 8% of tweets and Echofon (iPhone or iPad only) also picked up 3%. 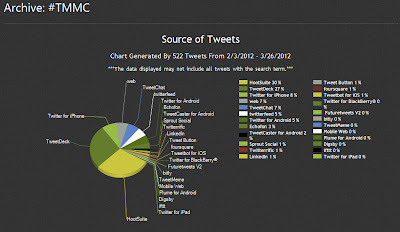 Twitter for Android and Tweetcaster for Android were in use as well and Twitter for BlackBerry was used for less than 1% of tweets. To continue the discussions well into 2013, we encourage everyone to join the LinkedIn Group. This is a global network of professionals from all industries who share a common goal to track and develop Mobile Marketing trends and developments. Plus, keep up with the latest news by subscribing to updates from us on Facebook or Twitter. If you are interested in sharing your conference insights here or contributing a guest blog, please contact me, Michelle LeBlanc, at mleblanc@iirusa.com. We'd love to have your input!